Two Lincoln Highway talks are planned this week. Bonnie Heimbach, project director of the Lincoln Highway Coalition, will speak at Kishwaukee Valley Heritage Society’s Brown Bag Luncheon from noon-1 p.m. Wednesday, Feb. 16, 2011 (at the Water Works Building, 622 Park Ave., Genoa) about the transcontinental road and its impact on Illinois. The luncheon also will feature the LHC’s traveling exhibit of the Lincoln Highway. There is no charge to attend, but donations are welcome. For more information, call (815) 784-5559. Above, the offical LHA Packard visits the. MacMahon memorial brick pillar near Crestline, Ohio. Courtesy Univ. of Michigan, Special Collections Library. 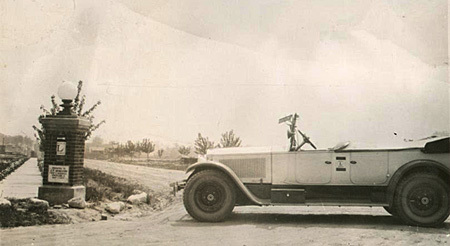 On Saturday, February 19, Bob Lichty, Past President of the Lincoln Highway Association and former board member of Ohio’s Lincoln Highway Heritage Corridor, will discuss the Lincoln Highway at The National Packard Museum in Warren, Ohio, northwest of Youngstown. His talk will include a brief history of the road, recollections of the 2003 Cross Country tour, and a preview of the LHA centennial tours in 2013. The presentation, from 11 a.m. to noon, is part of the museum’s Coffee and Donut Seminar Series that coincides with its 1th Annual Antique Motorcycle exhibit, “Motorcycles on Main Street,” which feature a collection of more than 30 significant two wheel machines. They are on display through May 29 alongside 25 beautiful Packard automobiles and memorabilia from the museum’s outstanding collection. The educational seminars are free and open to the public but you must pre-register. For more information or to registar call the museum at (330) 394-1899. 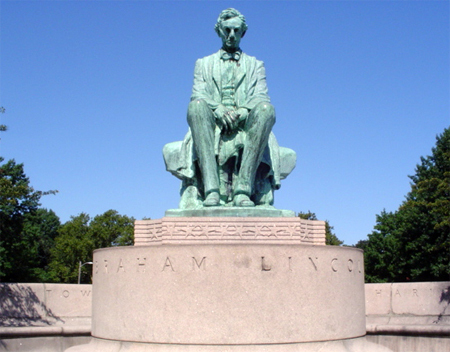 On Saturday, February 12, 2011, noon, an annual ceremony will be held along the Lincoln Highway at the statue of Abraham Lincoln at the entrance of Lincoln Park, Kennedy Boulevard and Belmont Avenue in Jersey City. Lincoln Association VP Michael Ricciardone will host the ceremony, and Past President Dr. Jules Ladenheim will recite a letter or speech of President Lincoln. A local chorale will provide patriotic music, and the ceremony will conclude with a placing of a wreath at the monument. At 6 pm, the Association will host the One Hundred Forty-Sixth Annual Dinner at the Casino in the Park, Lincoln Park, Jersey City. 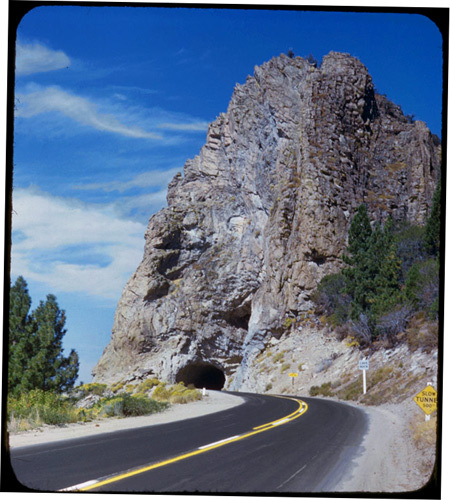 The Los Angeles Times reports that while planning for a 30-mile bike path along the Nevada shore of Lake Tahoe moves ahead, concerns from local Native Americans may halt the project at Cave Rock, considered a sacred site by the Washoe Tribe. The vintage slide below shows the site before a second tunnel was bored; the Lincoln Highway originally ran around the left side, which overlooks the lake. The path is to be part of the Nevada Stateline-to-Stateline Bikeway Project, which aims to provide non-auto transportation opportunities that link recreation areas, community centers, transportation facilities, and neighborhoods in the bikeway corridor to expand recreational access and transportation choices for residents and visitors to the Tahoe Basin. The Native American tribe doesn’t want people traveling around either side of the rock, which has been the target of past lawsuits over rock climbing. Proponents have looked into a route that would take the bikeway down the Old Lincoln Highway route, which roughly detours around Cave Rock on the lake side. Project leaders told the board they want to keep the cycling route off U.S. Highway 50 as much as possible for the good of bikers and motorists alike. The path would connect Stateline on the south shore to Crystal Bay in the north. 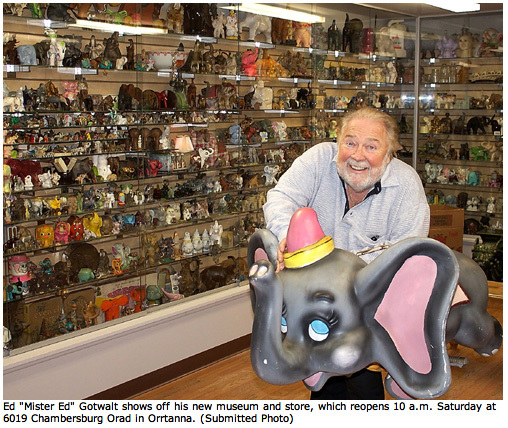 Mister Ed's Elephant Museum rebuilt, reopens! The new museum features two elephant sculptures made from salvaged pieces of the destroyed elephant souvenirs. You can visit at 6019 Chambersburg Road/U.S. 30 in Orrtanna, between Chambersburg and Gettysburg, from 10 am – 5 pm daily; admission is FREE. Contributions made to the Tammy Lee Cullison Save the Animal Fund, in memory of Gotwalt’s daughter, will be given to the SPCA in Gettysburg and Chambersburg and an animal sanctuary in Tennessee.